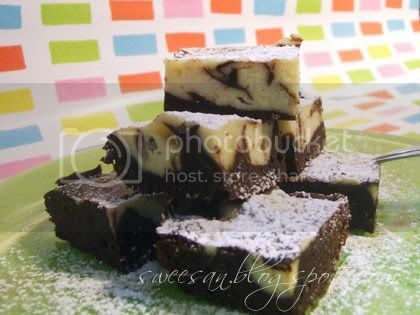 I came across David Lebovitz’s Cheesecake Brownies and wanted to make them. Chocolate + Cream Cheese = yay! 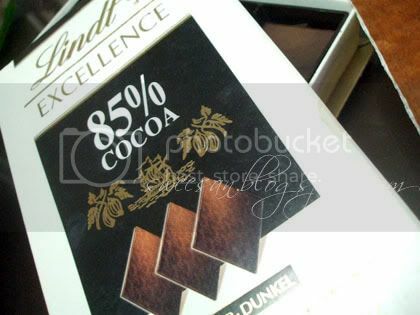 I found a 85% lindt Chocolate in the fridge. 85%’s gotta be really bitter! yay! even better! But I didn’t use all, as I was going to add something else as well, so chocolate bitterness can’t be the main component in there. I used Callebaut’s Dark Chocolate as well. What was I going to add ? Chilli Powder! Yay! Recently I’ve been quite gung-ho about Chilli Chocolate. Salt and Chocolate used to be the hit thing. It still is, but I think chili chocolate rocks too! plus, the kick kills of the sweetness and its sends a little curiosity out to those who’s eating it. 1. Line a 9-inch (23cm) square pan with foil, making sure it goes up all four sides. Use two sheets if necessary. Mist with non-stick spray or grease lightly. 3. In a medium saucepan, melt the butter and chocolate over low heat, stirring until smooth. Remove from heat and beat in the sugar, then the eggs. 4. Mix in the flour, cocoa powder, chili powder and salt, then the vanilla and chocolate pieces. Spread evenly in the prepared pan. 5. In a separate bowl, beat together the cream cheese, the yolk, 5 tablespoons (75g) of sugar, cinnamon powder and vanilla until smooth. 7. Bake for 35 minutes, or until the batter in the center of the pan feels just set. 3 Comments on Brownies with a kick! 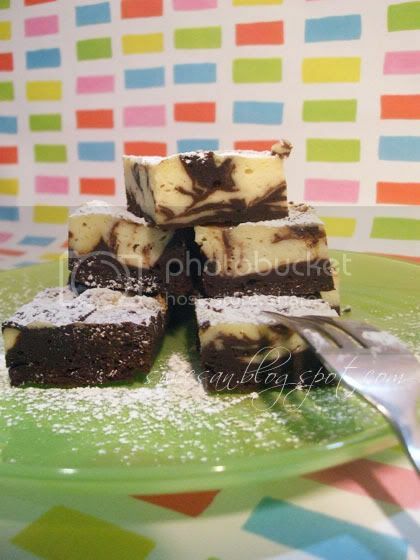 Love the addition of cream cheese, makes the brownies look so much more interesting! Looks yummy and would like to try it out but a question can i omit the chili powder?